IRTA's wholly owned subsidiary, Universal Currency Clearinghouse (UC), has operated as a successful global inter-exchange clearinghouse platform for trade exchanges for seventeen years. UC was conceived as a strategic advancement in the industry that would allow barter companies to trade through a common currency thereby increasing the trade volume of all participants, operating to attract many more businesses to the barter model worldwide. In the last seventeen years the barter software industry has grown, providing barter exchanges a large choice of software platforms to choose from, many of which provide their own version of inter-exchange currencies. These inter-exchange currencies in effect compete with UC, thereby further splintering the industry, which is counter to UC's original goal of providing a true universal trading currency to unify the industry. During the last seventeen years UC has leased its barter software platform from various software companies, no different than a typical barter exchange. In the last four years UC has explored creating its own software and examined other cooperative arrangements with existing software companies. The first goal of this process was to find the best possible software for UC. The second goal was to provide an "API Hub" that would link all the barter software to the UC system, thereby fulfilling UC's original vision of unifying the barter industry through its platform. UC talked with virtually every barter software company in the world and accepted proposals from numerous software companies in the last four years. Several proposals were pursued to the draft agreement stage and one proposal was consummated in 2013, which resulted in UC shifting its platform for a six-month "test-run." Unfortunately, that software ultimately was not chosen as a long-term platform for UC, and it was determined that other options needed to be re-examined. Both UC and IRTA have insisted that any prospective new software provider for UC should have the financial resources to provide ongoing first-rate technological improvements to the software, so as to constantly be at the forefront of the technology curve. In the judgment of the IRTA Global Board of Directors, the existing Bartercard software, combined with the financial resources resulting from a successful IPO through BPS Technology, would provide UC the best opportunity to utilize and recommend a highly advanced technology solution to the industry. Additionally, the strict governance standards requirements of a separate independent publicly listed company would insure members’ data would always be protected. As a result, the IRTA Global Board of Directors approved moving forward with a contingent contract with BPS Technology for an initial five year term with two potential additional five year terms, but only if both parties elect to continue for the extra five-year terms. The agreement would become effective only if the BPS Technology IPO was successfully completed by August 31, 2014. The BPS/IRTA/UC software initiative is still a work in progress. And because the contract is of contingent nature and does not commence without a successful IPO, IRTA/UC was waiting to receive evidence of a successful IPO before making any announcements about the project. However, IRTA/UC has been advised by BPS that the Australian Securities and Investment Commission (ASIC) has approved its prospectus, having met and passed all the strict legal and accounting requirements that comes with a listing, and the IPO is open effective August 5, 2014. The terms and conditions of the BPS Technology agreement are similar to the draft agreements that IRTA/UC had previously negotiated with other industry software vendors, (including its existing software vendor), which for various reasons did not come to fruition. All those software companies supported UC/IRTA's vision of a system unified by common technology and software when they were the company being seriously considered by UC/IRTA. If the BPS/IRTA/UC agreement becomes operable, neither UC nor IRTA will be in the software business. Per the agreement with BPS Technology, IRTA and UC will recommend and endorse the BPS software as long as BPS continues to modernize and improve the software in a manner consistent with technological changes in the industry. Participation on the BPS platform will not be a requirement of membership in IRTA or UC, as all industry members are free to select whatever software they conclude is best for their company. Additionally, industry members will be able to seamlessly tie-in to the UC platform to make UC sales and purchases, even if they are on software different than UC's software. If the BPS IPO is not successful, UC/IRTA will continue to negotiate with all interested barter industry software companies to accomplish the goal of providing a sound platform for UC and a mechanism to unify and increase trading for the entire global barter industry. For more info on IRTA, click here. 1) Determine the goals of your promotional products program. At minimum, you will need two to four weeks for production and delivery of standard products. Don't wait until the last moment to call your trade exchange, plan ahead and give your broker time to search for the items you’re interested in. 3) Involve your target audience. Be creative in how you distribute, package, and deliver your promotional products. Make it a memorable experience for the recipient. 4) Choose promotional products that have longevity. Put your logo on products that your target customer will see often. Products that are kept on the desk, in the car, or on the refrigerator can create dozens of impressions per day. Check web sites, read promotional-product magazines, and talk with specialists in that industry. Let them make creative recommendations from their database of thousands of products. Check with your trade broker to see what's available through your exchange. What Percentage Of Your Sales Goes For Advertising? If you're the typical company, you are not budgeting nearly enough money for advertising. Many franchisers require that 3% to 6% of sales go to advertising — more than most small businesses spend, according to Padgett Business Services. The world's largest consumer goods manufacturer, Procter & Gamble, spends 12¢ of every dollar earned on advertising. Yet the Denver Small Business Development Center reports that most retailers budget less than 2%. As a member of a trade exchange you can afford to do considerably more in this all-important department, because a variety of advertising mediums are readily available. So check with your trade broker today. Tom Peters, noted management speaker, shared this succinct thought recently. "This is my #1 belief about management. All we have is our time. The way we distribute it is our strategic plan, our vision, our values. Period. "So," he continued, "how did you spend your precious time today? Tell me, and I’ll tell you what you actually care about — it’s a simple and unerring equation." Copyright BarterNews 2014. 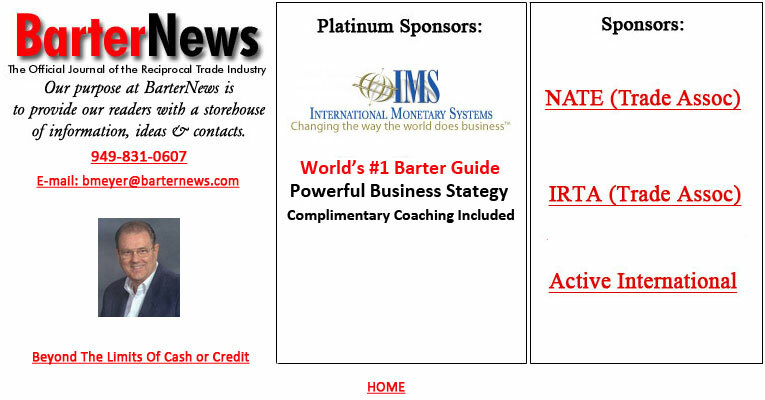 Redistribution of BarterNews content expressly prohibited without the prior written permission of BarterNews.